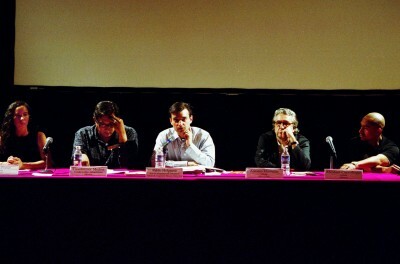 Andrea Fraser, Cuauhtémoc Medina, Pablo Helguera, Antonio Muntadas, Abraham Cruzvillegas; CENART, 2002. The Museum as Medium was a two-part symposium organized by Pablo Helguera that took place in the Spring of 2002 at The Centro Nacional de las Artes in Mexico City (CENART) and at the Guggenheim Museum in New York. The symposium mainly explored the legacy of institutional critique in museum practice, and the two events, which partially included the same participants in different cities, included the participation of James Elkins, Cuauhtemoc Medina, Cornelia Parker, Christine Hill, Antonio Muntadas, Lynne Cooke, Fred Wilson, Guillermo Santamarina, Osvaldo Sanchez, Abraham Cruzvillegas, Gregory Volk, James Putnam, Marco Barrera Bassols, Francis Alÿs, Michael Fehr, Julian Zugazagoitia, Minerva Cuevas, and others. The preliminary dialogue (below) explored some of the issues in advance of the debate. 1. [Pablo Helguera]: What elements, in your opinion, constitute the most important part of the visitor’s museum experience today? In this age of consumption the contemplative attitude has been supplanted by an engagement with art – especially contemporary – that has more to do with the possibility of acquiring it and making it one’s own. Consumption is fast, must change constantly and be diversified. It is no surprise, then, that participatory works and ones that engage the audience dynamically have recently received acclaim. Perhaps the most interesting shift is that a good museum experience has less to do with the actual programming or collection presented than with the quality of the shopping opportunities, the offerings of the museum café and the pristine cleanliness of the lavatories. I think it would be difficult not to acknowledge certain elements that prevail in the visitor experience to (art) museums, which are not associated with the educational goals, nor with the exceptional states of consciousness, nor with any other “epidermic” forms of allurement that constitute the principles of art. Some of the elements are the ability to conform to a social milieu and its resulting reelaboration of contextual values (specially as it relates to financial goods), such as hobbies, the alternative of being distracted from everyday chores, the assimilation of information and of significant historical parameters, civic agendas, or that which relates to programs from political parties. These would be followed by some related elements with the design, the (multi-faceted) implementation, and the assimilation of the messages that the museum distributes and legitimizes; the “look” of the museum (its architectural design, its museographic innovations, etc.) and the use of its alternative services (café and library). Perhaps after those, the elements that could then follow in the list would be the appreciation of technical dexterity, the approaches to new tendencies or styles, the approach to the contents by certain works, the surprise element or the sensual responses, triggered by the works; and the identification of various perceptive levels. 2. [Pablo Helguera]: How can museums best facilitate connections between visitors and contemporary art? Could you name a particular exhibition, project, or presentation style that has succeeded in doing so? For me the primary function and responsibility of a museum of modern and/or contemporary art is to present and preserve works of art for the public under the best possible circumstances, according priority to the various needs of each individual work, whatever that may entail. The most important part of the viewer’s experience becomes the opportunity to view works under such conditions. Museums can facilitate connections between visitors and contemporary art by applying this mandate to their mission statement, and making every effort to realize it. At the same time this experience can be supplemented by a wide variety of pedagogical aids, information presented in ways that enhances and expands upon the experience rather than filtering or directing it. The forms this takes can be manifold, more or less participatory, including lectures, free brochures, guided tours, reading rooms, video documentaries, symposia and the like. An exemplary instance of this in my recent experience is the Barnett Newman exhibition currently on view at the Philadelphia Museum of art. The work has been chosen after a rigorous and thorough examination of each potential exhibit to ensure that it is in sufficient condition to travel. The scale of the show is generous as well as stringent so that every work contributes substantively to an understanding of the artist’s project and achievement. The hanging is well calibrated so that each piece is individually well lit and spaciously installed, and the sequencing from work to work, gallery to gallery unfolds subtly to reveal the complexities and nuances of Newman’s artistic evolution. Discrete wall texts, located between rooms, and not on the same walls as the works of art, briefly characterize developments in his thought and practice within a wider historical framework. Free head-sets are available to all visitors that provides an informative program. Beyond the exhibition, in a separate space that is sound-proof, is a film made with the artist. Additionally, a scholarly symposium was offered at minimal cost to the public, together with a fully documented catalogue containing new research. Guided tours by docents, and installations of work by Newman’s contemporaries and by artists working within Newman’s legacy may be found in galleries adjacent to the exhibition. The show is on view for four months in order to allow for repeated viewing, and extended evening hours are designed to facilitate attendance. Some four years of detailed preparation, in close consultation with the artist’s estate, forms the basis of this exceptional exhibition. is notable, and impressive, is how well it has been carried out. Thus while new models may need to be invented for exceptional or novel situations, in certain cases there are well defined guidelines, responsibilities, standards, and exemplar that have been carefully wrought and honed through the professional practice of curators working in institutions over the past half century. In-depth knowledge of those practices, and a commitment to realizing them at the highest standard may be as important as the invention of new techniques and solutions to unprecedented circumstances. Two of the most successful juxtapositions in the V&A were the works of Mark Quinn and duo Neil Cummings and Marysia Lewandowska. Marc Quinn exhibited marble sculptures of real people who had been deprived of one or more limbs as a result of birth, illness or accident. First shown in the rarified atmosphere of The Prada Foundation in Milan they became much more challenging by their positioning in the classical sculpture galleries of the V&A. They were exhibited beside idealized heroic Greek and Roman statuary that once perfect, had lost their limbs through the passage of time. Their similarities were as great as their differences, the real versus the mythologized, the maimed versus the idealized, the cold perfection of new marble versus the weathered and aged antiquities. The fact that Marc Quinn’s sculptures were portraits of real people (who were present at the opening) made them in this context very powerful, evoking a mixture of pride and poignancy. Neil Cummings and Marysia Lewandowska created a site specific sound piece for the V&A. The noisy clatter of crockery recorded at a school canteen echoed around the scores of glass cases filled with the museum’s prized collection of historical porcelain, most of which almost certainly had never been used. Both pieces breathed a sense of humanity into the hushed reverence of the Museum. It depends on each project. From my point of view, museography tends to protagonize, and the overpopulation of didactic materials often offends and distracts. Other times it is necessary to add information that overflows with specific requirements about what is being shown (registrar information, contextual, biographical and bibliographical data, additions, ironies, metaphors, learning tools, acknowledgements, hymns, codes, instructives, and other tools or keys). Both accessories can generat meaning , by use of their excess or absence, distance or boredom. However, the rules should be clear and direct. An emblematic exhibition would be “Do It” (curated by Hans Ulrich Obrist)- if you were to break its original sense it would corrupt itself and not have the same effect. The last 20 years or so have yielded an extraordinary increase in the number and power of art world professionals, namely those such as curators, critics, gallerists, collectors, and directors who are not artists themselves but who contribute greatly to what art gets shown, how it is shown, and what constitutes the discourse. I hardly mean to suggest that this is an egregious situation, although it does give one reason for pause. For instance, when one views yet another large-scale exhibition (such as the various biennials), which ultimately are far more about the role of the curator, and curatorial praxis and less about the art and artists themselves. In any event, it is possible that this professionalization (or ultra-professionalization) of the arts does have its drawbacks, and this includes the inner-workings of museums themselves. In other words, it is possible at times that the discourse, behavior, and the specialized ways of such managerial “professionals” might actually occur at quite a distance from artists and their concerns, and, for that matter, from the viewers. One way of dealing with such a situation (with all its attendant rules and hierarchies) would be to occasionally present works that temporarily suspend the usual way that things occur in a museum, indeed works that both question and transform some of the core level elements of the museum experience. Here it is worth recalling the Russian literary critic Mikhail Bakhtin, and specifically his theory of the carnival, which he applied to literature but which could equally be applied to visual art and perhaps many other genres. In Bakhtin’s terms, the “carnivalized moment,” or the “carnivalized Situation” are those moments when the normal rules, hierarchies, values, and modes of apprehension are temporarily suspended in favor of a brand new freedom, one which can be simultaneously ungainly and spiritually elevated, as well as confusing and substantially liberating. Importantly, for Bakhtin these carnivalized moments in no way seek to transcend or obliterate normal: life —they are not revolutionary in the sense of wanting to substitute a new, improved consciousness for an exhausted, defunct one but rather, co-exist side by side, and one’s experience has everything to do with participating in both, moving back and forth between the two, entering the carnivalized situation in order to be tested and transformed and then returning to one’s normal life with some of the wisdom that one has gained. I will give 2 examples not pertaining to presentation methodology (which would be a curatorial objective) but of artworks themselves that succeeded in developing fresh, vigorous, and surprising relationships with the viewers, or, in Bakhtin’s terms, – ‘carnivalized situations’. The first was Mark Dion’s “laboratory procedure” enacted in the lobby of the Bell Museum in Providence, as part of his “New England Digs” project. Essentially, Dion’s exhibition involved finding, and then scouring, cleaning, and displaying an amazingly eclectic assortment of cultural objects found at natural sites, such as the beach. These items were then brought to the museum, where they were eventually displayed in vitrines, but first they were publicly cleaned and sorted. Thus, the viewer entered the museum and immediately passed a bevy of people wearing gloves and boots, and doing the kind of cleaning or preservation activity that would normally be occurring far from the public, behind closed doors. This sort of destabilization made one unsure whether the lobby of the museum was a construction site, an art project, or a science fair —but also, quite frankly, quite wonderful. Certainly it was lively, hilarious, and unusual. The artist, and his assistants, interacted with the public, a task became a kind of performance, and a portion of the museum became a wild card zone, temporarily freed up from its usual designated function. Such moments when the normal rules, rituals, and modes of apprehension are temporarily suspended are often times extremely welcome. The other example is German artist Karin Sander’s 1994 “Projects Room” exhibition at MoMA, which involved, among other things, an Astroturf floorpiece, half of which was installed in the interior lobby with the remainder outside in the sculpture garden. Similar to the Dion work, Sander’s piece substantially altered a very familiar aspect of the museum experience, namely how one behaves as a viewer. Here, one could lounge on her work, talk with others on it, and the experience was indeed very invigorating. Of course, one element of such an institution as MoMA is its very institutional quality, which Sander’s work effectively countered. I would mention the Creative Residencies Program of the Museum of Natural History in Mexico City. The museum is undergoing a profound process of renovation. We are trying to keep a distance from similar processes and from the paradigm of the British Museum and from XVIIIth century conceptions that still characterize many of these museums. The interconnections between science and art, and the relationships that our museum maintains with artists who develop projects in this regard, are in agreement with the new mission of our museum that seeks to encourage experimentation and innovation. Through a laboratory and an exhibition space, we seek to showcase the creative process. The museum has worked for the past three years with a visual arts curator (Elías Levín, from Museo de Arte Carrillo Gil and the MUCA) as coordinator of this program along with an advisory council. The program consists in receiving project proposals, that once selected we seek to fund them in a long-term basis, which could go beyond the yearly or six-year cycles of the Mexican political system, and which allows us to show better results. The museum seeks through diverse means to open itself to new forms of knowledge, not only through the scientifical understanding of the relationships between nature, humanity and the universe, but also through perception, history and contemporary, scientifical, artistic, philosophical and civilization-related issues. In this way we are similar to the transformation that the old Museum of Natural History of Lyon is undergoing, and which will eventually become the new museum of The Confluences. In this way, we are contemplating an architectural program that, aside of including the laboratory and the exhibition space for the various ongoing projects, may include an exhibition space for Land Art and Environmental Art projects, and children learning areas for gardening and landscape. All this is based on an open criteria for what we consider cultural patrimony, and on what we consider may eventually increase the public and benefit our agenda for forming collections. (Known as our Diversum Project, for the creation of a National Biological and Cultural Diversity Collection). This question is best answered with the assumption that the visitors have come to a museum to view the historical rather than the contemporary works given that the public perceives museums as institutions that relate to the past rather than the present. Museums have tended to opt for projects that involve artist intervention where the contemporary works are interwoven with historical artifacts and architecture. This strategy is usually most successful when the historical works are presented in their permanent gallery (along with the contemporary works) and not set apart in a special exhibition gallery. Alternatively they are sometimes installed in a prominent site-like a lobby where they receive the museum’s flow-through traffic or captive audience. The installation of contemporary works has to be done in such a way that they do not detract from the visitor’s usual viewing experience or priority agenda to look at the historical artifacts. It is therefore vital that these works are seen within an understandable context for the museum visitor especially since they may neither be familiar with the artist’s work or contemporary art in general. It is therefore important that the contemporary art communicates easily with the viewer without having to refer to a complex sub-text. Museums have frequently used the idea of juxtaposing the past with the present, exhibiting a work by a contemporary artist alongside a historical one that has certain similarities or may have inspired its production. Yet this comparative approach offers less challenge and somewhat patronizes a visitor’s perceptive abilities or confirms a preconception that contemporary art will never match the quality of historical art. Perhaps, the most successful contemporary art projects in museums are those which provoke thought and questioning about the very nature of viewing. They inspire in the viewer a sense of human continuity where the historical artifacts are re-animated in such a way that they become simultaneously relevant to the culture of the past and present. In this respect such presentations challenge the museum’s traditional linear approach to chronology and might even take an alternative interpretation which stimulates and inspires the visitor. Contemporary art projects in museums work best when they incorporate the museum’s traditional ‘language’ of presentation – by use of vitrines and descriptive labels rather than introducing work that is alien to the museum’s usual presentation experience. Video, new media, audio guides and talks are now all common parts of the museum’s existing interpretive methods and contemporary artists have used them effectively for museum specific projects. 3. [Pablo Helguera]: How does a museum context alter the meaning of an artwork or a body of work? I am sure the key word is ‘validation’ here. Obviously, if a museum ensures visibility that was otherwise unavailable, that serves the artwork. In a positive light, the museum context edits a body of work to hone its most effective characteristics. In a negative light, a museum context reduces the body of work and removes it from its ‘real’ existence and imposes a state of ‘mortuary’ upon it. Marxist theorists claim that the meaning of a work of art depends on the political and social circumstances in which it is read. The museum provides an autonomous and ‘official’ overview of what is most significant about a work of art or how it is best viewed or perceived. As a public institution the museum is the premier stage in the network of validation for art beyond the dealers, collectors and critics. The very fact that a work of art that has been acquired by a museum means that it is worthy of preservation for posterity and thus historically significant. The museum houses and displays its new art acquisitions in the company of ‘important’ works which are publicly acknowledged as masterpieces and thus confers on them an ‘official’ seal of quality and authenticity. The irony of Duchamp’s readymades, the bottle-rack and the urinal, is that while they proclaim the notion of the anti-authentic and anti-meaning of art, once exhibited in a museum they maintain their significance as ‘original’, signed works, and can no longer remain banal utilitarian objects. Certain works of art in museums take on an ‘iconic’ status like the Mona Lisa and become merely an item on the tourist agenda to tick off a hit list of – ‘been there, seen it’. The museum context thus provides an aura of authenticity and preciousness around a work which attracts visitors towards its physical space, like a religious icon. Meanwhile an altarpiece removed from a church and placed in a museum naturally loses its votive religious function and undergoes a contextual shift as an ‘art object’. The voice of the museum ‘expert’ relies much on an art historical tradition of the significance of biography which helps to cultivate the mythic image of the artist. Thus the meaning of a work of art is influenced by what is known about the artist’s life and this connoisseurship or knowledge represents power. This can be the authoritative ‘voice’ of the museum expert talking down to the passive spectator. It has been noted that the viewer plays a major role in the reception of a work of art and the shaping of its meaning so the museum is a ‘neutral’ bridge in this collaborative process. Yet despite its claims to be apolitical, the museum never quite manages to maintain the level of institutional neutrality it aspires to. In a 90% of the probabilities, the museum context imposes a special value to the artistic object while this is in its surroundings. If, in fact the perception of objects as art is dependent to the institutional endorsement and to the onsite museum situation, there is a first “modification” of the particular semiotic hierarchy of each work (duchampian inversion). The significance of a work of art is modestly autonomous from other areas of knowledge, of society, of economic positionings. It is less the work of art that changes than our gaze. The museum is yet another frame; frame of reference, context…The museum that was designated as a death institution in the 70’s has managed to integrate even those critical works which claimed its death. In the worst case scenario the museum has a nullifying capacity that puts on hold the subversive capacity of the artwork. The museum through the transformation of a critical piece into a “historical” piece subsumes some of the original efficiency of the work. But the most radical way a museum can sabotage the sense of any given work is by storing it in a reserve out of the public’s sight. 4. [Pablo Helguera]: Is there a particular aspect of art museums that has interested you or informed your work, and why? I do not by nature gravitate to ‘art’ museums when visiting new cities. A visit to a foreign grocery store is a much more informed sampling of the culture than perusal of its modern art collection. Obviously, this is not the case with local history museums, archives, etc. I suppose I am interested in what a culture ‘collects and displays’, and this can be witnessed well outside of the museum space. sort of experience they seek out of a visit to a museum (I assume: transformation, transportation, elevation, widening of perspective) and making work that offers them these tools outside of the museum space. An art museum is a host and a potential collaborator. Certain projects are helped by this relationship, but not all. Ideally, a museum is intrigued by the artistic production and hoping to spur or to fuel it. A museum gives to the artwork by supporting it institutionally, and the artist in return, modifies production to fit within the museum designated parameters. If these parameters are too limiting, the exchange is not fruitful and the work should be done outside of the museum. Conservation. I first became interested in conservation when making the installation piece The Maybe 1995 (a collaboration with actress Tilda Swinton). I borrowed various iconic objects linked to famous historical figures from museum collections to exhibit in the contemporary art context of the Serpentine Gallery. One of the objects I borrowed was the pillow taken off of Freud’s couch, from the Freud Museum. When returning it I noticed a feather poking through the surface of the fabric and wondered what would happen if it fell to the floor, would it still be part of the object, or like dust from the couch just get vacuumed up at the next cleaning. I became intrigued in the concept of the non-object and made an on going series of work entitled Avoided Object. I became interested in the inverse of the iconic, the monumental, the cliched, the most visited, the most gazed upon. The idea of the Avoided Object focussed on the subconscious of the monument, the underside of the iconic, the non-object. From the conservation department of the Tate Gallery I borrowed a collection of canvas liners taken from Tuner paintings. They had been replaced when the works were re-stretched and now lay in drawers saved as samples of 19thC canvas. On a visit to the dept. I had noticed these pieces of canvas that bore the patina of 140 years of dirt; having been being hung face to the walls as the subtext to the masterpieces that they supported. They had an intrinsic Rothko-like quality of their own. 7 of them were framed and hung on the walls like a mini Rothko room as an installation entitled Room for Margins 1998. (Alongside margins of Turner paintings) The piece was finally re-acquisitioned by the Tate and moved to the Modern collection as an example of my work. 5. [Pablo Helguera]: Museums typically function as providers of value and historical relevance of the art they present. How do you see this function evolving in the future? First of all, I’m not so sure about the premise of this question, namely the part about “value” and “historical relevance.” For instance, at the Staatsgalerie, which is the main museum in Stuttgart, Germany, there is a minuscule number of works by women in the collection, and what works there are almost never exhibited. The National Gallery in Iceland typically takes years and years to recognize the relevance of works by Icelandic artists, and in many instances has been downright hostile to those works. I also do not consider these to be isolated examples, for biases (occurring for whatever reason) unfortunately continue to be a fundamental aspect of museums. For example, right now one can see a major exhibition by German painter Gerhard Richter, while a major exhibition by Eva Hesse has been canceled (or delayed). Given that, I have little or no idea how museums will evolve in the future, I can only hope that they make a serious and sustained commitment to deal with and transcend the kind of biases and exclusionary practices that have been so prominent in the past. The public needs to be viewed, more and more, as an integral part of the artwork. Contemporary artworks are constantly listening and reacting to the public, they await their interaction, and they hope to be taken on wild tangents. Artworks want to be inspired by the public; they want to be activated in diverse and unexpected ways. Unfortunately, many museums have a paternalistic approach to the public, denying their performative sophistication, and often relegate them to the role of consumer, thus limiting the artwork to a pre-established performance of representation. Museums have traditionally relied on a complicated hierarchy of exclusions and marginalizations in order to focus economic and cultural attention on a portfolio of select artworks and artists. We could call this portfolio the “theme” of the museum, if we are to take the popular interpretation of museums as a form of theme park. In my opinion, the problem arises when Museums do not acknowledge their “theme” and instead claim that their collection is “representative”. Pseudo-exhaustive art collections often define a linear historicist narrative of moments or actors in history and, of course, there can never be a comprehensive, exhaustive nor neutral representation. Museums need to acknowledge this partiality in extremely creative and insistent ways, thus opening more rooms for the creative public. Museology is shadowed, I think, by a problem so large and so difficult that it is often bypassed or finessed in contemporary discourse. The problem is the simple subtraction of religious, spiritual, and ritual meaning from artworks. I think this problem occurs in two different domains: in Western medieval and other religious artifacts; and in non-Western tribal artifacts. First, in relation to Western medieval and other religious art. A few years ago there was an interesting exchange between two of the most interesting writers on this subject, the medievalists Michael Camille (University of Chicago) and Hans Belting (Hochschnle fur Gestaltung, Karlsruhe). Camille proposed there is an affinity between various postmodern strategies of display and the playfulness of medieval imagery, and he suggested that the meanings of medieval artifacts, which are flattened or lost in most museum settings, can be revived by displaying the objects in some of the fanciful and inventive ways invented by modern and postmodern artists. Objects could be hung from the ceiling, for example, or plaster casts could be shown in lieu of originals. Belting took a friendly but severe position in response: he said that no matter what is done to medieval objects, their original meanings will still be ruined by the institution of the museum. The more you try to create the contextual play that is said to characterize some of the original works (for instance, medieval marginalia or architectural ornaments), the further you will be from the original contexts. That exchange, which took place at a College Art Association meeting, was part of a far wider inquiry into the nature of medieval objects, and their relation to art. Philosophically and historically, that discussion which is intermittent but ongoing in art history’s interesting and fruitful, because it sheds light on what can be written as art history, and what objects can be productively described using the language of art history, which was itself developed in the wake of aesthetics – that is, in the wake of the rise of art itself. For me the important writers in this regard are Belting, Camille, and David Summers. But when it comes to answering the same question in relation to museums, I agree entirely with Belting: there is no solution. The only subject that remains to be studied is the variety and depth of our illusions and rationalizations: the false reasoning and false assumptions that allow curators to continue to show religious objects in museum settings that are effectively indistinguishable from the settings provided for non-religious artworks. The other domain in which this problem occurs is the display of non-Western tribal art. Here the debates are just as wide-ranging, culminating most recently in the plans for the new Musee du Quai Branly in Paris. The new museum, which will incorporate the holdings of the African and Oceanic museum and the anthropological museum, will display artifacts from all cultures as if they were Western, post-Renaissance artworks: that is, the objects will be more or less isolated against white walls and in vitrines. The new museum will not try to contextualize them as anthropological museums traditionally have done, and it will attempt to remove hierarchies between cultures. The initiative is intended to avoid the inevitable Eurocentrism involved in comparing Western and non-Western works (as in, for example, the infamous “Primitivism” exhibition at the Museum of Modern Art), and it will also avoid the hopeless attempt to provide a “natural” context by creating diorama-like assemblages of works from a given culture (as in natural history museums). But this problem is as insuperable, as conceptually intractable, as the problem of Western religious artifacts. If the Musée du Quai Branly is built as it is being advertised, it will simply appear as the latest Western attempt to erase Westernness. How could it be otherwise, at least until the day that all the museums in Paris coalesce into a single enormous disordered (unhierarchical) collection? And even then, what will prevent the museum’s white walls, and the aesthetics of quiet contemplation, from encasing each object in the atmosphere of Western aesthetics? In sum: I think the largest unsolved (insoluble) problem, the contradictory condition on which museums are built, is the inexorable destruction of the meaning of religious and other non-art artifacts. It cannot be solved: it can only register the particular level of obliviousness that informs curatorial discourse at any given moment. Museums of contemporary and modern art are exploring new ways of creating sense and narratives beyond the historical / schools/ nations approach. The Tate Modern, MoMA’s 2000 exhibitions. Formal groupings is just another narrative that works out of the ancient historical model. A favored role of museums: producers of works along with the artists. Every time, I increasingly find that curators try to include in their projects works which may contain a “critical’ or “skeptical’ aspect about the legitimizing role of the institution, creating in turn a new domesticity from within. The mechanisms and methodologies, the rules and the consensus which each participant (artists, administrators, curators, and the audience) undertakes, hopes for and takes on should be clarified. By clarification I mean to assume the basis from which one is dialoguing and participating. The audience member is generally the first one in expressing their doubt or their boredom. I wish the function of the cultural institutions could be restructured by rethinking their public character and not only as mere architectural spaces for exhibitions. Nowadays, the audience of a museum is, in itself, very specific, and the gallery even more so. The vision of these institutions is completely self-absorbed, concerned with survival and prestige, loosing the opportunity of being relevant. In the case of museums, the reclaiming of the public terrain is a challenge that, if met, could make them into important and living social agents with the ability to go beyond their regular functions and thus have a larger cultural and political presence. The actual necessity of art is overestimated. Nowadays, if we pay attention, art making tends to manifest itself at a very superficial and irrelevant way, closer to the lifestyle of a few than the sign of intellectual activity. On the other hand, government and cultural institutions take over budget decisions and corporations and individuals operate base on economical convenience or inconvenience. The only thing, in my mind, that can validate and give weight to museums and galleries as institutions would be the relevance in the social contexts in which they are part of, which seems impossible without a thorough revision of their practices from a professional and ethical standpoint at every level. Evidently, the road to this goal is not direct, as for this end we would need to place artmaking into a more complex understanding of the significance of culture in society, and thus ensure an appropriate cultivating field with a radical change in terms of education so that such changes can take place and evolve. This is not a utopian task, given that we are the ones who make some of the decisions (and I believe we are). It would only take to identify the potential that we have in our hands. We will need to ensure that contemporary art institutions are replaced in the future by spaces for intellectual production. 6. [Pablo Helguera]: Many artists regard collecting as the center of their artistic activity. How does this attitude impact the nature of art collecting? Why is it relevant to establish a division between collecting as part of the artistic process and art collecting? If this is ‘collecting’ in the sense of maintaining an ‘archive’ then: Artist collecting (as in Richter’s ‘Atlas’; as in the tourism documents of Fischli and Weiss; as in the sammelsorium of Jack Smith; as in every working artist’s combined source materials and individual collective obsessions) is highly valuable, as proof of experience and illustration of where one places value. This reflects my thesis that there is more inherent value in a selection of appropriated objects by an artist than in objects fashioned by an artist. If this is ‘collecting’ in terms of being placed in art collections of note: This has thus far played very little role in my own production. This supports too severely the notion of a fetishized object, and that is rather opposite to the methods I am engaged in. A collector should be interested in accessing a means of production, in facilitating a thought process. Whether that yields a souvenir object or not should be a secondary concern, and is irrelevant. In terms of marking history, other forms of documentation need to be employed. There is this long tradition of artist collecting where they acquire images and objects both as inspiration and to use as a working medium. Their studios can become a kind of personal museum where objects are sorted and even classified for incorporation into their work in the manner of the objet trouv*. Many artists go on to present their personal keepsakes or objects that are charged with memory as an integral part of their work. In their presentation of their collections of objects they are frequently inspired by museum ordering systems, taxonomy, archaeology, ethnography, anthropology and material culture. But unlike classic collectors who collect objects which are rare and valuable, artist’s tend to collect trivial worthless things. Ironically, in an almost alchemical process, they can go on to transform these collections of worthless objects into works of art of considerable value. Artist collecting relates to ‘ work in progress’ and in that respect it is very different from art collecting where the collector only acquires what has been finally designated as a work of art by the artist. Some of the collected objects that artists use in their work, which were once contemporary, worthless junk have themselves since become collectable items in themselves. When exhibited a decade later they might also take on a nostalgic value in the mind of the viewer which was not relevant when they were created since these objects were merely trivial, discarded consumer items. Going beyond the fact that some artist may openly assume that collecting/recollecting would be the core of their activity, as it is the case of those who choose to open their own “museums”, there is a core difference between the kind of transformation that the artist-collected objects/images/cirtumstances/works collected undergo and the kind of change that occurs with the works that belong to an art collection, such as going intto another collection, being sold, stored, or vanish as a commercial or symbolical good. Although there are artists that also experiment on these aspects, I rather like the romantic notion that the object can wander from one status to another, and that at some point it could stop being a work of art to become prime matter again. The museum is potentially a place of inspiration…a place to contemplate…a place where one can be unsure, or change one’s mind. I am interested in the value and meaning we collectively and individually bestow upon objects and images. I’m not really much of a collector. I consistently think of the work I am doing as a philosophical venture. But in the process I have produced, distributed, and amassed large amounts of images and things. I don’t think about these as single objects, but concern myself with the relationships between them – and the meanings implicit in their placement and combination. Let’s say that rather than singular items, I collect and create collections…..and by implication have built small museums. 7. [Pablo Helguera]: How would you define the relationship between the urban environment and the museum, and how does one influence the other? Perhaps the architectural interventions of Peter Eisenman, typified as “artificial excavations”, would help to illustrate the role of museum’s leadership in the urban milieu, either by virtue of the pressure and seduction of the global tendencies. The museum paradigm that we are talking about here may not be unfamiliar to Mexico for very long. As a ready-made of its own, the museum legitimizes in a modern fashion the fictional –entrepreneurial and political- institutions that feed not only the market, but the global whole that we could describe as the corporative entities. Even though they try to pretend otherwise, the endeavors of museums are not directed to an avid public willing to learn, but to their high-class profile affiliates. The museum is thus compelled to play a critical role as top of mind locus in a market for the symbolical values [of art], which now are fundamental and that we could refer to as accessories of artificial identities. And this has been happening most notably from the Eighties, when museums started to lead in the tendency of architectural typology. The museum collects “pret-a-porter” models of reality and of belonging, and cities collect museums (followed, perhaps, by airports. Both airports and museums are paradigmatic stages of the nomadic transactions in the former, and of the sedentary accumulations in the latter). To reflect on the role of the museum in the urban context would force us to ask ourselves what is the operational idea of context today. Are we still understanding the context as those physical and epistemological secretions from the social contract? The very becoming of architecture, and the subtle ways in which it has disserviced the public, has gradually been trashing ( with modern heroism ) any kind of local and specific rendering of urban models of cohabitation, living, segregation, and gathering. Even though Mexico City is not able to collect buildings, ( not to release the uses of public space to touristic consumption, as it happens in many other capitals), the idea of urban context for the visual art perception in Mexico does not seem to go beyond the exotization of the failures of the modern model of civility. The fact that the Mexican artists who create exotic fictions of the economical degradation of third world countries are fashionable today, as with the emergence of opportunistic metaphors, nostalgic of social solidarity, makes artists function as resellers of a symbolical market that they don’t even control, and reveals the absolute absence of a public sense of belonging. Museums work not anymore an aesthetics but rather a corporative fiscalization. The public as urban, and the architectural as a local landmark, have been put through the process of ideological abstraction, of uniformed masquerading and of recycling of identity, through their marketing as exclusive cultural products. It would seem that the museum does not only predetermine the work as it used to be a few years ago, departing from a formalistic apriorization that would emanate from the white cube and from its mystifying, added contents. Now the museum regulates artistic production, from the tacit servicing of its corporative clientele. From its very architectural conception, from its very symbolical power in the urban site, the museum conceives itself as the ruin of an imminent future. By its nature a museum stands apart from its immediate environment as traditionally it needs to take an objective, often retrospective view of culture. As a public institution it naturally aspires to be closer to a cathedral than a shopping mall yet it is increasingly under pressure to be up to date and in tune with contemporary sensibility. It needs to conform to the political correct climate and the scope of its activity is affected the economic situation of the time. Located within its urban environment the museum’s activities are becoming increasingly linked to the world of commerce. Besides franchising its consumer facilities like shops and restaurants, museums have created their own form of branding strategy and corporate identity often with the help of marketing consultants. In its fundraising proposals the museum proclaims its relationship to its urban environment by its guarantee to have active education and community outreach programmes, to attract new audiences and cater for ethnic minorities, disabled access etc..The museum’s strategy is increasingly conceived on business lines in terms of ‘production’ and ‘distribution’ – its scholarship has come to be equated with a product to be marketed and distributed by exhibitions and publications. Increasingly, dependent on donations from wealthy individuals, trusts and foundations, the museum markets its institutional space as reflected in the naming of its galleries and curatorial programmes after its sponsors. Perhaps one of the most significant areas of recent urban dialogue has been the emphasis museum architectural projects undertaken by leading high-profile architects. With the wider public interest in art and culture, the museum has become increasingly media sensitive as public institutions museums are frequently the target for criticism and need media coverage for their exhibitions. Museum’s collecting policy also provides a reflection of current taste and fashion which is particularly acute in the area of contemporary art. But it has often been pointed out that once a work of art enters a museum it ceases to be truly contemporary and loses some of its power or its original social context. We are looking to create a space dedicated to the Valley of Mexico, or what we call the mother city. This space seeks to see the city as a human ecosystem and a place where we can modify the vision of the population about their surroungings, better value their existing patrimony and bring to their attention the current environmental problems. Finally, our other extension program that is made in spaces such as the subway, or in places like the fence of the park as is the case of the photography project of Yann Arthus Bertrand, the Earth Seen from the Sky, (which has had so much success that it is estimated that 10 million people have seen it in the course of three months). We are also working on a project of Colombian origin, known as the Museum of the Street. We are working with the Fabrica de Artes y Oficios de Oriente (el Faro), a cultural center that brings together an association of street vendors. With them, we are establishing an exchange with street people so that once we compile a “collection” of objects artists can create and exhibit projects with them. The museum will offer medicinal plants in exchange of any object that people may want to contribute with. Our strategy is using the museum as medium, using the tools of global communication such as the web, radio and TV. I like it when the relationship with the museum becomes a pretext for something different from its original function. For example, when it becomes a public bathroom or a place for dating. In the case of the of people who visit Chapultepec Park in the city’s downtown area, need to use the restrooms. The same is true of the Centro Helio Oiticica in Rio de Janeiro, situated in a center of prostitution and drunks: it is a stain made with an eraser on carbon paper. But museums and galleries tend to also become in opportune places for demonstration and have a great capacity for gathering crowds- in its more chic version, they become bars and cocktail lounges. Eventually I am more seduced by the attitude of Miguel Calderón, Martin Creed or Mike Kelley, who they have directly turned them into concert halls, without evading the difference of intentions, nature and musical genre. 8. [Pablo Helguera]: How has the globalization of contemporary art impacted the emphasis of cities as locations for culture? How do you think museums should react to these tendencies? The volatility of capitals, the demographic mobility, but overall the capacity of transnational corporations to define the economic policies around their gains, have made obsolete the whole idea of “nation”, even as a concept of cultural representation. From there the fact that the new world economy seems to restore to the cities their protagonist role, which, for instance, existed during the times of the European Renaissance, before the emergence of Nation-States. The cities have thus become in the high-voltage nodes of exchanges, concentrations of consumers and service lenders, and consequently the mirrors where a symbolical representation is staged. All this has resulted in having cities become a commonplace curatorial point of departure, dominated by a geography which is defined by the points by which the airlines draw the maps of their networks of arrivals and transfers. The exhibition of cities operates, then, as the standard model of exhibition of the present, with the same insistence and repetition held before by the individual retrospective or the national pavillion in a biennial. As a symptom of this transformation of the imaginaries, contemporary art acts as a referent of a new geography where the distance between urban centers dissolves, while the vacuum that they have with the interstices do not connect to the new global circuit grows. A new dilemma opens in all this. For the museum, it would be counterproductive (if not impossible) to not define itself away from this new cartographic paradigm. To invent new models of urban representation becomes necessary in order to be truthful to this cultural era. However, as in any curatorial principle, this register only can be accompanied by internal criticisms of the model, inasmuch to challenge the routine of this self-representation of the agents of the global economy, than to question its hegemonic role. Additionally, the emphasis on the “city” theme under the dominion of globalization can also function as an alibi for forgetting the way in which nation-states, far from disappearing, are in a violent process of reconversion, if not of reconstruction. On one hand, the control of cultural resources is still , in most of the cases, tied to models of national cultural politics, whether from the state or not. This results in that, under the theme of “cities”, a series of renationalizing models of identity would be exercised in a not so subtle manner, where frequently the very elites who eroded the national control of the economies exacerbate the role of control (military, “patriotic” and populational) of the national apparatuses. The classic case is the way in which globalization is accompanied by national travelling exhibitions, where the function of museums like the Metropolitan or the Guggenheim in New York is to legitimize the symbolical existence of nations like Mexico and Brazil, which free trade is making efforts to evaporate. On the other hand, as the state becomes fundamentally a police mechanism (the guarantor of internal corporative security and of the national security doctrines to the “exterior”) it does not abandon its intentions to demand from museums proof of their “patriotic” loyalty. 9. [Pablo Helguera]: How has globalization affected the museumgoer? How do you think the expectations of a Mexican visitor may differ from a New York one? To what extent might those expectations be the result of differences in historical perspective, class-consciousness, and language? The most immediate answer to this question would consist in stressing the way in which the museum itself has transformed into a globalized experience. By replacing the visit to the permanent collection with a succession of travelling exhibitions commuting between various metropolises, the expansion of the franchise model exemplified by the corporative Guggenheim, the homogenization of the international museum schools and the development of a catalogue of “collectible” artists, all contributes to the transformation of the museum into a symbolical and interchangeable capital. If this tendency continues, museum buildings will very soon become similar to internet portals: virtual “places”, “un-places” for transit, which will reaffirm to the viewer the endless accessibility to any cultural good, limited more by its location than by the copyright norms. We are then abandoning the idea that going to the museum is like a pilgrimage to the place that holds the relics for an epiphanaic experience. In this post-museum system, we are left two forms of differentiation. On the one hand, the consumption of new curatorial models, where certain museum spaces manage to temporarily gain advantage over others by means of establishing a new and original exhibition/production. The other is the consumption of underdevelopment: the spaces that preserve the originality of the anachronism and marginality, that cannot adapt to the demands of the new market due to its placement in locations of small economical and symbolical activity. The case of Mexico is peculiar in this particular sense: on the one hand, the Mexican government (which almost holds the franchise monopoly of the term “museum” in the country) has perpetuated an intentional misinterpretation of what a museum is. In Mexico, the museum was not essentially a treasure-hold of collections of objects, but the tridimensional vitrine of oficialistic ideologies. The absence of collections (including a complete absence, in terms of contemporary art) has made the public accustomed to the notion that the term “museum” is equivalent to “exhibition space”. Far from serving as repositories of memory, Mexican museums have adopted an agenda many years ago of representing the volatility of the ephemeral. Their main object they exhibit, if it is not the bronze phrases of the politicians who sponsored them out of their own interest, is the doubtful inventive of the true official artists of the country : the architects. This is the origin of a rather paradoxical effect. The meager attempts for creating a traditional museum, such as the National Museum of Art in Mexico City, are, in fact, a form of resistance and cultural innovation. In contrast, the grandiose renovation projects for museums, as is the case of the National Museum of Anthropology, only manage to meet the short term necessity of refurbishing the wings in a decorative manner ruled only by the urgency to meet an opening date. For that very reason, the pressures that arise from the international traveling exhibition circuit, and from the subsequent insertion of the model of the international curator, have slightly approximated the museum experience in places that are so difficult to compare to one another such as Mexico and New York. Inasmuch the metropolis has commenced to represent the volatility of its symbolic capital by effect of the commercialization of the temporary exhibit, in the Mexican globalized provinces the adoption of the curatorial model has in fact helped to make the public partake of the museum experience to a certain extent. All this, of course, happens without the awareness of local cultural authorities, who aren’t able to distinguish the advantages of such actualization. Similarly, the New York Museum occasionally is affected by these interests and it even adopts the official models of museum policy of countries like Mexico. One merely has to view the recent Guggenheim exhibition “Brazil Body and Soul” in order to register what could very well be designated as the “mexicanization” of an international museum institution. “Brazil Body and Soul” (2002) reproduces with, scary fidelity, some of the steadfast formulas of the official Mexican museum school, derived from the practice of the museographer Fernando Gamboa: the exhibition of “national cultural patrimony” by use of dark, mythological caves, traversed by expressionist light, the pretense of retroactively reconcile the contradictory fragments of the “history of national art”, such as the Brazilian colonial Baroque and the Neoconcretism, on the basis of metahistorical speculations of state identity, the validation of the politics of ethnic and cultural integration of the national states through the ornamentation of the objects of “our indians” and, of course, the systematic depolitization of the reading of every cultural document. In this sense, it is always possible that, although merely momentarily, the center would imitate the periphery in its ideological abuse, the result of the hermetic control of these exhibition spaces. Facing these diverse global paradoxes, museum professionals and their audiences will have the obligation, in future years, of reformulating and renegotiating new forms of implementing the notion of curatorial and museum autonomy, in the same way as our intent resistance to the resulting impositions of an accelerated commercialization of cultural spaces and to challenge the authoritative administration of these museum spaces in ways in which, despite the evident political differences, act against the museum professional with the same arbitrary way, whether in the Mexico of the Fox era or in the Venezuela of Hugo Chavez. 10. [Pablo Helguera]: Many contemporary artists and curators have centered their inspiration and practice on urban anthropology, ethnology and sociology as they relate to contemporary life. The work of artists such as Mark Dion or Damien Hirst, is often presented in museum vitrines or as scientific displays. In the most recent exhibition at PS1 curated by Okuwi Ewenzor, “The Short Century”, art, political history, and sociology come together to portray a cultural period in Africa. How has the relationship between contemporary art and sociology, ethnology, and other socially based practices has evolved in recent years? And, how should contemporary art museums should best reflect this relationship? Precisely because it is such a generalized symptom of contemporary culture, it is not healthy to view “the interdisciplinary” as a homogeneous tendency. It is not the same to estheticize the equipments derived from scientific laboratories or the practice of the naturalist, renting the exhibition space to fashion designers and marketing specialists, than to contribute a curatorial model as radical as the one established by “The Short Century”, curated by Okuwi Ewenzor. This project has nothing to do with “applying” or “appropriating” academic production, since that it proposes an experience which makes us construct a new art history and a new experience of historical representations. What is most remarkable about Ewenzor’s exhibition is the way in which the construction of a curatorial dialogue between visual documentation, narratives, cultural fragments and works of art defies the dichotomy between “work and context”, forcing us to consider every work, image and exhibited object as moments of awareness of an extremely important social experience. The work accomplished by “The Short Century” goes much beyond the one of representing a cultural period: it potentially should make us radically rethink the relationships that we attribute to the most diverse forms of symbolical production, whether in Africa or in any other place. “Short Century” does not create an interdisciplinary strategy: it liberates a group of artworks from the static compartments where they were once placed by a cultural administration and it makes them shed light onto each other, question each other and reflect against themselves. On one hand, the exhibition manages to restore the intensity that made necessary to create works of art in this period, including the urgency of which abstract art and modernism had in Africa during the sixties. On the other and, it forces the spectator, maybe for the very first time, to register the emotional power of a multiplicity of testimonies, both historical and individual. It would not be excessive to say that besides addressing the decolonization of Africa as a theme, it is in itself one more stage of that same decolonization. Having said that, maybe it would be possible to set the hope that the creative use that contemporary artists have made out of disciplines so unrelated as cultural studies, philosophy, thermodynamics and psychoanalysis, should be valid in the same transformation of those academic and cultural disciplines. In other words, the fact that the artist has so often become into an artist/researcher. Suggests the possibility of making us reassess what until now we have understood as the critical and academic activity. On one hand, we are not far from the day in which the training of social scientists of the most diverse kind would include, aside from the development of literary skills, a dose of curatorial training. The anthropologist or sociologist of the future will not merely produce texts, but will also have to reassess the very means of his production in order to assume the concept of “exhibition” in the larger sense of the term. Some of the most interesting academics presently (from Susan Buck-Morss and Rosalind Krauss to Roger Bartra and Carlos Monsivaís) have already initiated the work of conceiving their creations not only as pages of a printed text, but also as book-objects. In the same way, the artistic research such as the movie by Isaac Julien on Franz Fanon, the videos of Faroki or the projects by Stan Douglas already prefigure new ways of intellectual work. It is desirable that the museum would stop being the confirmation mechanism of the commercial legitimacy of artistic products (always undistinguishable from the artistic legitimization of commercial products) in order to restart its function of space of academic and political experimentation. But in order to arrive to this very possibility, it will have to establish limits to the dominant model, consisting of the cult of the blockbuster show, the submission to the interests of its boutique-bookstore, and of regarding itself as yet another corporation. A question in return. How do natural history museums preserve culture? What sense of culture is embodied in the collections of stuffed and mounted mammals? I think natural history museums do preserve a sense of culture: it is the culture —the social class that values liberal arts education. It is very important to note that natural history museums are aimed more at children and adolescents than art museums. The parents who take their children to natural history museums want their children to have a sense of the natural world and the “family of man,” and that sense in turn is supposed to make them better fit for a liberal arts college education and a place in educated, middle class society. Notice the interesting parallel with art museums. There are parents who take their (reluctant) children to art museums, as witness books like Janson’s History of Art for Children. The parents’ purpose is to inculcate, prematurely I think, an appreciation for fine art that is the mark of a slightly higher social class, more upper-middle class than lower-middle class. I have a very pessimistic, or cynical, sense of how natural history and art museums preserve and present culture. It seems to me that artists, historians, and others in the art world strongly underestimate the ignorance of the average museum visitor. I teach classes in which students copy paintings in the museum, and that experience has given me many opportunities to speak to ordinary visitors: not the ones who attend museum lectures, or even fill out surveys. The overwhelming majority of people who visit art museums, I think, has almost no idea of art history. Everyone can distinguish Old Master from modern paintings, but within those two categories the overwhelming majority cannot distinguish periods or artists. The same, I suspect, is true of people who prefer natural history museums. Is that a sense of culture worth attending to? It’s the main reason I am not involved in museum education or curatorial work. I think all such enterprises are compelled to do one of two things: preach to the small numbers of the converted, or carry on an invisible work —something that, at its best, provides a colorful and entertaining backdrop for a weekend in the big city. 11. [Pablo Helguera]: The Internet is really forcing any museum that cares about cutting-edge artistic practice to rethink its role in the present century. The decreasing relevance of museums in a networked world is a continually recurring topic in online discussions about art, perhaps made most concrete by the dot-com museum controversy. What is the impact of new technologies on museums and their collecting practices? There is a tendency for “technologically correct” art, as critic Lorne Falk says, where artists, museums and galleries adopt technology not to create experiences specific to the new media, but rather to leverage and validate their current grab-bag of metaculture. Many years ago I wrote a text for Leonardo magazine called “Perverting Technological Correctness” where I outlined some strategies artists deploy to corrupt the inevitability of corporate technologies. Among them, I included the simulation of technology itself, the use of pain, ephemeral intervention, misuse of technology, non-digital approaches to virtuality and resistance to what I call the “effect” effect. Museums must limit their desire to export strategies of critique and presentation that belong to video art, cinema, or mass media into electronic art. Any insertion of electronic art into a museum or art centre has to factor in the time and space needed for new relationships to flourish. 12. [Pablo Helguera]: In 2001, the Guggenheim launched a “Preserving the Immaterial” Initiative, directed to exploring ways to preserve art made with variable or ephemeral media. Do you think museums should make efforts to preserve and collect artwork that is expressively made not to be collected, memorialized or preserved? Douglas Crimp’s old notion of the “Museum as Mausoleum” is no longer accurate; today artworks do not go to a Museum to die. The opposite really is true: Museums render artworks immortal through preservation, citation, restoration and, as of late, by virtual simulation and emulation. Artworks become Vampires that are denied an honourable death, as architect Emilio López-Galiacho would put it. The vampiric culture of suspended animation and preservation needs, in my opinion, to be balanced by a comprehensive plan of cultural perpetration and performance. Strategies of production and dissemination closer to those of the performing arts will help museums a) cope with the new mechanics of networked culture, where multiple entry points are available and radical taxonomies are fostered and may coexist, b) oscillate between levels of mediation and disintermediation based on a plurality of readings of the artworks¹ performances, c) become “relationship-specific”, in the sense that the emphasis is not on the essential or even “important” characteristics of an art object, or on the narratives that power elites may bestow on them, but rather on the micro-politics of new temporary relationships that may arise from experiencing them. When organizing the conference on a similar subject for the Getty “mortality/immortality the legacy of the xxth century” we invited and commissioned French Artist Michel Delacroix to work along with us during the process of the developing the conference agenda in order to react to the topics to be addressed by creating a site specific installation. His piece was a large block of ice with wax letters imbedded in the middle spelling out the names of celebrated artists. As the conference developed over its 3 days, the block melted releasing the letters. Hence revealing the notion that for new artists to come others must disappear. Mutandis tutantis the same can be said about works of art, especially the attempt to conserve works destined to be ephemeral. The art world has always been influenced by what has been lost as much as by what has been preserved (art and art history were certainly born, as the myth goes, from the impossibility of conserving forever the ephemeral silhouette of a beloved one). Yes and no. Yes, because that way it would meet its institutional duties. No, in deference to the norms of copyrights, or to respect the physical laws of the existence, permanence and tolerance of living beings. 13. [Pablo Helguera]: What happens to an artist’ work when it becomes museum-specific? Hopefully an artist, by the time an exchange with a museum is relevant, has developed a vocabulary and a means of production that are autonomous of any museum framework. In isolated cases a direct conversation within a museum space can be compelling, but an insider-only dialogue (addressing the ‘art world’ as the insider) needs to be avoided. Work is most effective when it is penetrating varying levels of specificity, so that any viewer can access it, and access is heightened by additional information. But not so that lack of information reduces the ability to respond to the work. No work becomes “museum-specific”. If at all, it is museum-specific from its origins, and it is designed and conceived to be that way, otherwise, it doesn’t. What happens with these works depends on its level of openness: if it is a work that needs to be modified by the public, if it is “interactive”, if it seeks to offer a certain service (like amuse, inform, communicate, become the vehicle of something, move, etc.) or if its objective is to change (self-destruct, rot, accumulate, reorder itself, etc.) the assessment of its quality will depend on how it effectively achieves its goals- otherwise it becomes mere fortunate or unfortunate chance. 14. [Pablo Helguera]: How effective do you regard the emergence of hybrid models for presenting contemporary art? (e.g. using aspects from clubs, bazaars, commercial halls, amusement parks?) Which models if any do you see as viable options in the reinvention of the museum? A culturally interested audience has as much use for these models as it has for a museum. There is a problem when museums attempt to co-opt these forms and gain momentum from their energy. The introduction, for example, of the DJ into the ‘museum opening’ is presented as a ‘crossing over’, when in fact it is the DJ and his/her assembled credibility being ‘lent’ to the museum. We may have ironically heard –and frakly it’s not that funny- that today the most “alternative” spaces to do a work of art are the institutional museums. But the strategy has also been conventionalized, either through inviting artists to “take”, “invade” “squat” or “habitate” other places, including natural history or historical museums, houses, abandoned buildings, match boxes, window displays, malls, bakeries and light posts. Any option is viable as long as the “avant-garde” desire of going against something would not be the main battlecry. On one level the incorporation of hybrid spaces are generally very exciting for an art crowed in search of new stimuli. Some great surprises have sprung from this kind re-contextualization. Very seldom, however, does the non-initiated public seem to comprehend it. The museum, with its defects and quality still serves the purpose of providing the context for focusing on the art, an experience still demanded by the public. Also we have seen works of art opening our aesthetic appraisal, introducing museum the outside world into the museum and therefore transforming forever our way of looking into the outside (shouldn’t art always be a transformation of the gaze?). Perhaps the cross-fertilization of the clubs, bazaars, amusement parks, and museums will generate a new kind of spectator, one that would challenge and make reappraise and look afresh around us. 15. [Pablo Helguera]: Can work that mostly incorporates found objects have an artistic function outside of the framework of the museum? be choosing objects that speak to his/her own language, and that hold weight. A museum should value such works equally to those that have been manufactured by artists. I am not sure I understand the relevance of asking whether these have an artistic function ‘outside the framework of the museum’. ANY artwork should have relevance and resonance outside a museum, regardless of how its method of production. 16. [Pablo Helguera]: If the notion of the museum were to be entirely reinvented, which existing elements of it should be preserved? equitable to the artist. This also calls for a redefinition of what constitutes ‘viable’ artwork for museum exhibition and collection. The bottom line fact that the artist as producer is the originator of the value placed on these systems needs to be upheld. The element that I consider will never disppear is the one of exhibition. The connections that made possible this medium in the museum, the curatorial practice and collectionism, will be modified in the sense of being open to more trans-disciplinary visions and even giving room to the interpretations of the public. The museum tends to be inclusive y will have to be definitely recognized as part of the venues of massive communication. Museums will abandon their cathedral-like vision as far as their internal and curatorial function is concerned, although their architectural reference to the temple will be preserved. The door frame (and no door), again to have some sort of context, but without any borders or barriers (save the curators, too and the collections). None. At a personal level, our friends. 17. [Pablo Helguera]: What kind of risks do you think an art institution should take today to take on a leadership role in the presentation of contemporary art? tended more toward blockbuster shows, or shows-as-spectacle, of which the Guggenheim is a prime example. In the most simple terms, generally speaking, It’s to the smaller, comparatively underfunded museums that one goes for cutting edge contemporary art, and not to the major museums. constitute a significant discovery for the museum-going public. This would make the museum itself more urgent; indeed if done well the museums could become the first place to see important work by artists (especially international artists) who might have been underrepresented, or perhaps not represented at all, elsewhere locally. In many cases, the absence of “leadership’ is associated with the programming of exhibitions, and not to the didactic part, which tends to devalue the interpretations, explaining and simulating understanding. I think that the requirement of tools to understand the works and the artists and the showcase of their processes can be the key. Artist-in-residence programs can be an interesting way of producion, as they create connections between the various participants, and emphasize the context and the individuals, and going beyond the idea of groups as anonimous entitites. Instead of scheduling twelve exhibitions a year, a small museum can organize with a small budget three or four very good exhibitions that showcase these kind of live processes, including parallel publications. A large museum can do much more with less time constraints. It would also be key to encourage the participation of the private sector. I do no share the notion of positioning and leadership in the process of legitimization of contemporary art. The kind of risks that an institution takes by participating in this race are subject to an economic stability, to political priorities, to ambitions of specific social groups and to bureaucracies that have significantly weakened the artistic social exercises. On the other hand, in an utopian kind of way, the risks and the competition could be precisely characterized in the divorce of the models that now are imposed, and the assimilation of the communication avenues —between the institution and its public — effectively related to the principles of art. 18. [Pablo Helguera]: Could you think of any questions that you would like to address to other panelists? Is it possible to distinguish between the values invested in art and the needs of professional and institutional reproduction? 1. For curators: Why bother working in and around museums, when so little of what is done is noticed or understood? 2. For artists: Why intervene in museums, when even the most radical interventions effect only microscopic changes in museum practice or public understanding? Please name three works of art (any kind) for a New Musée Imaginaire I would like to create. 1. A very general and simple question: What is the relationship between the museum and contemporary politics? To what extent can the contemporary museum, under the control of the regime and the economical and administrative forces that lie upon it, broker an environment of reflection on the alternatives to the conflicts and ideological impositions that are in vogue? 2. What is the status of the notion of “public” in the museum institution nowadays? What is the difference between the “public” character of the museum and the necessity of catering to the “audiences” or “publics” , “communities” or “clients” an answer at least in regards to the condition of the museum as a public space? to take on curatorial roles in museums? will have a developed understanding of contemporary art from the West. As museums are, similar to artworks, completely artificial settings that can be designed in almost any way, one cannot only look at them with a view informed by art and art-history but can analyze them with the same methods used to understand art-works. Applying such methods, it will be made possible to consider, first, that museums are not media systems but spatial systems capable of taking in, or frame everything man-made as far as it can be isolated from its context – and therefore can put any medium on display as well, exposing by this its specific properties and the according conditions of perception. In this light, second, museums can be perceived and analyzed as complex space-images-systems not only as far as they display images of differently conceived spaces as well as different interrelationships of objects and figures in space, but also in the sense that these images and interrelationships structure different spaces while being looked at. From this point of view it might be perceived that, as far as any spatiality depicted or designed includes a distinct perception of space and time, museums, (as collections and presentations of those space-images) can offer a specific setting of their own within which these different spatial conceptions are set in perspective. In other words: Unlike to media, museums can make it possible to experience concretely different ways of creating a reality, and by this can offer an insight of the mechanisms of the rise and fall of systems as well as in the relativity of perception in general. As an observer in the second order (someone recognizing that another individual is building a specific context showing something with a particular intent). As the visitor might shift freely between these different forms of seeing, he/she might be able to perceive the museum space according to a work of art – having a multi-layered reality of its own – and may experience what can be addressed as ‘structural perception’. Structural perception is the core of any museum experience. Often oppressed, structural perception is what only museums can offer and what should be enhanced or developed in order to create individual museums and make their visits a unique experience. Structural perception is a given, built-in aspect of every museum anyway, obvious already when it is considered that most museum’s visits are performed in groups, buy this with as many views present at what is on display as individuals form those collectives. Therefore, any form of normalizing visitor’s perception by media will deflect the specific museum’s experience, and should not be encouraged. In the opposite: Only if museums enhance and promote the specifics of the museum’s experience and perform – by structure and content – as a true alternative to the stodgy diet of images we are fed daily by the media they will have chance to draw on a new audience and be successful in future.